FIRST STOP: National Gallery of Canada: There have been numerous poets working in and through the National Gallery of Canada over the years. Staff alone have included Susan McMaster, Nina Berkhout, Anita Lahey, John Barton, Robyn Jeffrey and Stephanie Bolster. Susan McMaster, for example, worked at the Gallery from 1988 to 2008, predominantly as Senior Book Editor, as well as founding editor of Vernissage, the bilingual art quarterly of the National Gallery of Canada. McMaster, mentioned briefly during my Glebe walk as a founding member of the intermedia group First Draft, was also the President of The League of Canadian Poets(2011-12), founding editor of the national feminist magazine Branching Out (1973-80), served on the editorial boards of Arc Poetry Magazine and Quarry magazine, and was head of the Feminist Caucus and the Freedom of Expression committees of The League of Canadian Poets. She is the author or editor of some two dozen poetry books, anthologies and periodicals, as well as recordings with First Draft, SugarBeat and Geode Music and Poetry, and her work has been presented at the Great Canadian Theatre Company, and workshopped at the National Arts Centre Atelier. The benefit to a poet editing such a magazine as Vernissage was the possibility of original poetry appearing in each issue. Work was included by both English and French-language poets, thanks in part to an editorial assist by two published and well-respected Francophone poets, Claire Rochon and Myriam Afriat, both of whom were already working at the Gallery as editors. As McMaster says: “Rather than using translators, except I think two cases, we used different poems per issue, always matched to artworks.” At different points, Ottawa poets John Newlove, Anita Lahey, Colin Morton and Sylvia Adams also worked for the magazine as editors and/or feature writers, and there were contributions by multiple other poets, including Governor General’s Award-winner Denise Desautels, Hélène Dorion and Gabriel Lalonde. As McMaster responded via email: “Starting with that first issue, works by poets from across the country were made available in almost every issue of the magazine until I left, and were also mounted on the new audioguides.” She was good enough to provide an extensive list of writers from across Canada with poems published in the pages of Vernissage during her tenure, a list I include here in full: Stephanie Bolster, Ian Tamblyn, François Morel, Veda Hille, Jean-Noël Pontbriand, Douglas Burnet Smith, Michel Andrée Sincennes, Penn Kemp, Elizabeth Gourlay, Gabriel Lalonde, Christopher Patton, Sandy Shreve, George Whipple, Hélène Dorion, Denise Desautels, François Vigneault, Jocelyn Boisvert, Sylvia Adams, Colin Morton, Heather Pyrcz, Roy Campbell, Anita Lahey, Diana Brebner, John Barton, Inge Israel and Gabriel Lalonde. It was McMaster who invited Bolster to a meeting at the gallery which led to her being hired as Assistant Editor on October 1, 1998, where Bolster remained until she moved to Montreal to join the Creative Writing faculty of the English Department at Concordia University in the fall of 2000. In 2002, McMaster returned to her previous position of Senior Book Editor, with John Barton taking over the position of Editor in Chief of Vernissage, a position he held until he left for Victoria, British Columbia to take over The Malahat Review in 2004.
looks you straight in the eye, and you flourish. my mouth (that wants to gape) stubbornly shut. every good thing will be words in my mouth. and how small you have become. could your hips span other than yourself? and mine by such exposure. SECOND STOP: 206 Saint Patrick Street: From 1995 to 2015, poet, fiction writer, publisher and activist John Bart Gerald and his wife, the artist Julie Maas, lived at 206 Saint Patrick Street where they ran an Atelier/showroom for their publications and artwork. Born in New York City in 1940, Gerald worked with Dr. Albert Schweitzer in 1960, lectured at City College of New York and ran workshops at Saint Mark’s Poetry Project in the 1960s, marched with Dr. Martin Luther King in 1965 from Selma to Montgomery, Alabama, and published novels in 1964 (Viking) and 1972 (Farrar Straus & Giroux). A former lecturer at Harvard, he quit the university for their refusal to comment on the Vietnam War. 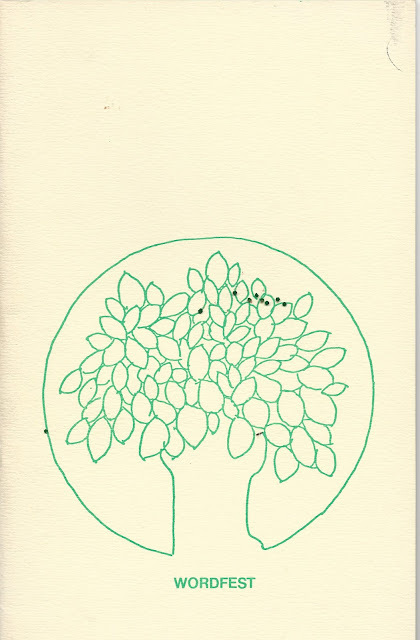 The couple co-founded gerald and mass in 1978 to produce small publications of their combined writing and artwork, as well as the Convention against Genocide when it fell out of print. After years of living in Maine, he moved his family to Ottawa in 1995, where he spent twenty years very active in writing, publishing and activism, before moving to Montreal in 2015. 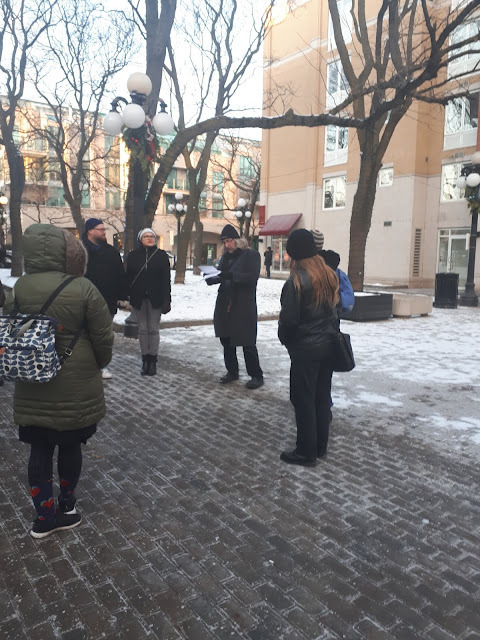 THIRD STOP: 18 Murray Street: In June, 1972, Ottawa poet William Hawkins, discussed as part of the Centretown walk, and others were responsible for a poetry reading outside in the Byward Market to memorialize the old Victoria Hotel, a building that had been torn down earlier that year. The reading was held in the hotel’s back yard at 18 Murray Street, an event we are only aware of due to the entire transcript of the event published as a book by Commoner’s Press in 1973 as Northern Comfort, a book self-described as “being a reading of poetry by various people, given in the back yard of the Victoria Hotel 18 Murray Street, the Byward Market, Ottawa, on the evening of June 29th, 1972.” An article from the Ottawa Citizen from October 25, 1972 writes that “The three story building at 18 Murray St has erroneously come to be known as the Victoria Hotel. NCC spokesmen said its historical value is vague and ‘marginal’ at best. […] It is assumed to have been built in 1862.” The blog Urbsite posted an article on February 8, 2014 [http://urbsite.blogspot.com/2014/02/the-victoria-hotel.html] that provides further information on the history of the site, including on the confusion of where exactly the Victoria Hotel may have sat, and a plethora of information on fires, National Capital Commission missed opportunities, and what lives here now. 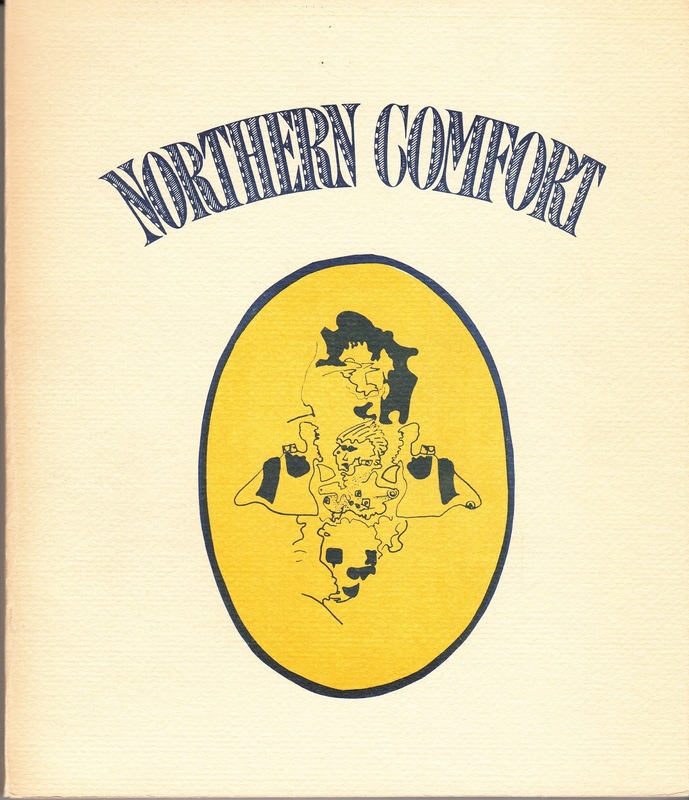 Northern Comfort occupies a unique position in these respects (at least so far as my own reading has turned up). While the text initially appears to offer an unadulterated transcription of the reading in question, numerous editorial comments, as well as an introductory note, make clear that this is a fragment rather than a whole. However, what is most interesting about Northern Comfort is that it was produced in the immediate wake of the reading, rather than at a later date and further distance. It was transcribed and published within one year of the reading. The effect of this, in my opinion, is to create an object that shares the spirit and intent of the initial reading. It is not total narrative, but rather a strange, bizarre, wonderful book-object that mirrors the described strange, bizarre, wonderful reading-event. The fidelity of Northern Comfort is not to the reading, but rather to the spirit of the reading. 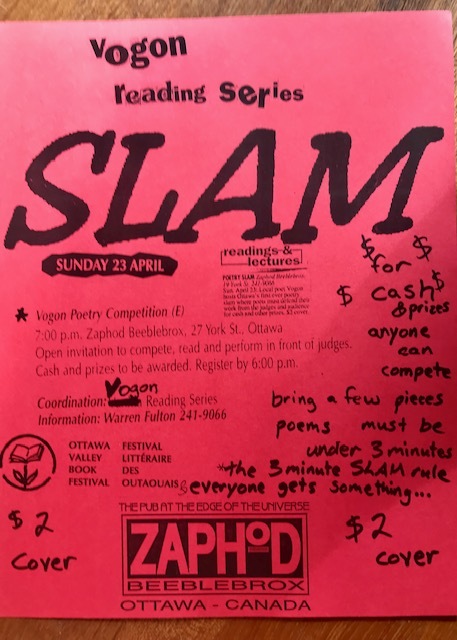 FOURTH STOP: 27 York Street: From November 1994 through the end of 1995, poet and chapbook publisher Warren Dean Fulton ran The Vogon Reading Series at Zaphod Beeblebrox. The series was named after the third worst poetry in the universe, taken, as the name of the club itself, from Douglas Adams’ infamous The Hitchhikers Guide to the Galaxy, a quintet of novels originally begun as a radio play. Ottawa’s Zaphod Beeblebrox self-described as “the original nightclub at the edge of the universe, an intimate live music venue and dance club featuring Pan Galactic Gargle Blasters and other such exotic cocktails,” and existed here as the club’s second location from 1992 through to May 4, 2017. 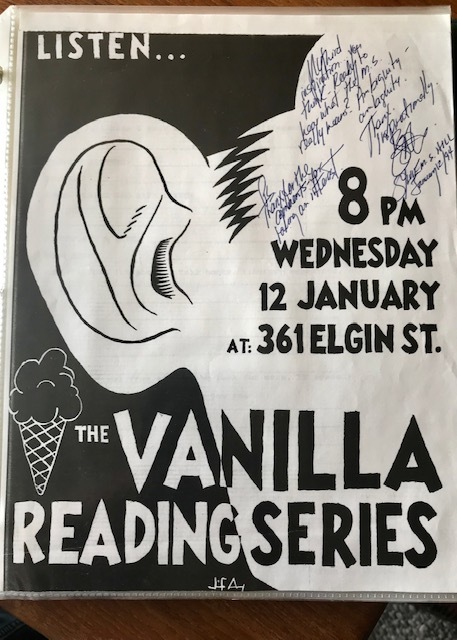 The Vogon Reading Series was a continuation of Fulton’s Vanilla Reading Series, a series held at Lois N’ Frima’s Ice Cream locations in both the Byward Market and on Elgin Street from October 1993 to October 1994, during Fulton’s time working there, providing poetry and ice cream to a bevy of confused customers and passers-by. Readers during these series included writers from Ottawa and beyond, such as Stan Rogal, Erin Manning, Nadia Halim, Gwendolyn Guth, James Spyker, Kathryn Payne, Death Waits (now known as Jacob Wren), Joe Blades, Catherine Jenkins and Patrick White, as well as a variety of slam poets, and launches for the quarterly poetry, fiction and comics journal Hostbox magazine. It was also around this time that Fulton founded Pooka Press, a small press focused on single-author poetry chapbooks, which still occasionally produces titles from time to time. It was through Vogon that Ottawa held the first Poetry Slam on April 23, 1995, as part of the Ottawa Valley Book Festival. As Fulton writes, a “Poetry Slam” was a “competitive, judged, and scored poetry event, called Slam, a novelty, a poetry gimmick, with prize money, introduced to me by Boston poet Marcel Kopp […. ].” He recalls an earlier competitive poetry event at Carleton University through the English Literature Society, held during his tenure as President of the ESL, but the first “Slam” event, following many of Slam founder Marc Smith’s original rules (formed in Chicago in 1984 through the GET ME HIGH LOUNGE), was held in Ottawa through the Vogon series. The slams drew immediate attention; the “summer slam” event, held August 6, 1995, had a crowd of more than one hundred people. There were concurrent Slam competitions emerging in Vancouver and Toronto during the same time, and Jill Battson, who organized the Toronto events, often came through Ottawa to participate in the Vogon events. The series also hosted the Ottawa launch of the Michael Holmes’ The Last Word anthology (Toronto ON: Insomniac Press, 1995), one of a handful of anthologies produced through the mid-1990s of the “next generation” of Canadian poets. The Vogon Reading Series finally shuttered when Fulton relocated to British Columbia, where he started working in the film and television industry, working on such projects as X-Men 3: The Last Stand, Arrow and Legion. Over the years, Fulton has occasionally returned to Ottawa to visit, as well as participate in the ottawa small press book fair, during which he would also instigate a series of literary pub crawls, later producing small chapbook anthologies of the resulting poems. FIFTH STOP: 55 ByWard Market Square: ByWard Market Building: When Ottawa’s VERSeFest Poetry Festival was founded in 2011, there were those who spoke of it as the city’s first poetry festival, unaware that there were at least two prior poetry festivals held within the city limits, both of which were first held in the ByWard Market. In 1996, for example, Rob Manery and I organized the first of what became three annual WHIPlash poetry festivals. Founded as a two-day event, the first annual WHIPlash festival was held in the basement of Café Deluxe on Dalhousie Street (the subsequent year’s festivals were organized solo by myself, with the second held at The Upstairs Club on Rideau Street, and the third at Club Saw in Arts Court). Prior to that, the collective organizers of The TREE Reading Series put together a two-day poetry festival on August 6 and 7, 1982 as the Ottawa Poetry Festival. The readings were held at S.A.W. Gallery, which at that point was housed in the north end of the second floor of the Byward Market Square, a building originally constructed from 1927 to 1928 as the fifth building to house Ottawa’s public market. The public market, itself, was established in the 1830s by Colonel John By, an English military engineer, known for supervising the construction of the Rideau Canal, and founder of the original Bytown, the village that would eventually become both Ottawa and Capital. SAW Gallery was originally named as an acronym for Sussex Annex Works, and founded in 1973 by a group of local artists in a space on the second floor of Café Le Hibou [an establishment discussed at length during my Centretown walk], which at that time was at its third and final location at 521 Sussex Avenue, before recloating to the Market Building. In 1989, SAW finally moved to its current home in Ottawa’s historic Arts Court Building. This is an historic occasion. It is Wordfest, and it marks the coming of age of poetry in Ottawa. We, calling ourselves the Ottawa Poetry Festival, had not so much an idea when we started as an opportunity which we took, and here, as in the SAW Gallery, we present the issue of our efforts. In this souvenir volume we present the work of all participants. With only two exceptions the poets are local, young and just beginning to come to notice in the city, the country, the continent and beyond. This is our theme, and inevitable once one begins to look at the talen in the city. And yet many of the poets represented here came to Ottawa from somewhere else. And all of them draw influences from elsewhere as well as here. A second Ottawa Poetry Festival was held a year later, again with accompanying chapbook anthology, and was expanded into a three-day event. Held from August 12 to 14, 1983 at the Friend’s Meeting House on Fourth Avenue (where The TREE Reading Series was being held at the time; see my Glebe Walk for further information on The TREE Reading Series), the second annual WORDFEST anthology was again produced by Colin Morton and Carole English, and included work by Richard Truhlar, Steven Smith, Colin Morton, Steve McCaffery, Robert Hogg, Michael Dean and Ottawa poet Catherine Ahearn, who was still in the midst of her tenure as Ottawa’s first official city poet laureate. While no one has expected me to pen verses in the manner of a D.C. Scott or an Archibald Lampman (the two best poets who ever lived here), I've been tempted to justify the honour of being Ottawa’s poet laureate by churning out heroic couplets on some epochal or historical event. Why not, for instance, trace the history of Ottawa as a burgeoning small lumber town, ringing with the cries of the Glengarry men on the Ottawa River on its way to becoming a bureaucracy-crazed nation’s capital? It was White who moved out to Perth, Ontario in February, 1988, not five months after Mayor Jim Durrell had named him Laureate, causing some consternation around White retaining the title of city laureate. Around the same time, some of the French-speaking poets in town were wondering why all three Ottawa Poet Laureates had been English. Whatever the prompting, after White’s tenure as Laureate, the position was quietly eliminated. Despite the likelihood that Ottawa had the first poet laureate position in the country, it was years before it would exist here again, even as laureates soon popped up all across Canada, from city laureates to provincial laureates to the ongoing federal version: after a focused campaign by the National Council of The League of Canadian Poets, the Parliamentary Poet Laureate position was created in 2002, a two-year post first held by Vancouver poet George Bowering. Through her own tenure, Ahearn wrote poems that seem exactly the kind Bowering would steer clear of, penning small pieces on the Ottawa River, or on Prince Charles and Lady Diana Spencer, some of which were collected in her self-published Poet Laureate poems, 1982-1984 (1984). After years of a variety of local writers petitioning the city to reintroduce the position, including Steve Artelle and Rod Pederson, it wasn’t until a committee as part of Ottawa’s VERSe Ottawa, the group that runs the annual VERSeFest Poetry Festival, that the city finally agreed. The new two-year position, one with a proper amount of compensation, is now held in both official languages, and the first two poets laureate were announced as part of the festival in March, 2017: Andrée Lacelle and Jamaal Jackson Rogers. The second pair of laureates will be announced at VERSeFest in March, 2019. SIXTH STOP: 56 Byward Market Square: The Mercury Lounge was the original home of Capital Slam, the biggest regular Spoken Word Poetry Showcase in Ottawa history. Organizers of the series have been legion, including Danielle K.L. Gregoire, Elissa Molino, Nathanael Larochette, Brad Morden, Sarah Ruszala, Blue, Janica Shivkumar and Rusty Priske. Capital Slam was founded in 2004 as a response to the first National Slam Championship, which had been held in Ottawa that same year. Moving around to a couple of venues after its original inception, Capital Slam returned to the Mercury for its seasons finals in 2007, where it remained until October 2015, thus cementing Mercury’s moniker as “The Home of Slam in Ottawa.” By the time of the subsequent event, in November 2015, Capital Slam had relocated to the University of Ottawa’s Café Alternatif, an event which also included the Capital Slam slam debut of Apollo the Child (who won that night’s slam). Slams were still held monthly, but, according to online reports written up by Rusty Priske, only up to March 2016 [Gregoire suggests events did occur for a few months beyond this]. During CapSlam’s run at the Mercury, they fielded two National Slam Champion teams, in 2009 and 2010, as well as launching the careers of two World Slam Champions, Ian Keteku and OpenSecret (Ikenna Onyegbula). Some names included in those last few years of Capital Slam would include names familiar to those who attend local readings, from John Akpata, Blue and Sarah Ruszala to Lazy Hero, Omar Saghir and Avonlea Fotheringham, but would also include appearances by Amal El-Mohtar, an award-winning writer of fiction, poetry and criticism who subsequently held the position of Writer in Residence at the University of Ottawa before becoming Otherworldly columnist at the New York Times earlier this year, and Sarah Kabamba, who longlisted for the CBC Poetry Prize in 2017. The Mercury Lounge also briefly hosted The Factory Reading Series, circa 2005, before the series permanently relocated to The Carleton Tavern, as well as some of the above/ground press anniversary events (beginning with the 13th anniversary event, and culminating with the 20th anniversary event in 2013), early launches for the Ottawa poetry pdf annual ottawater, and a variety of events over the years organized as part of Ottawa’s annual VERSeFest Poetry Festival.